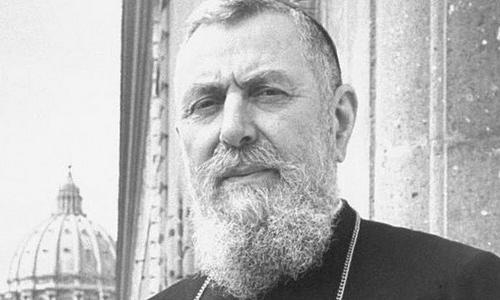 Cardinal Eugène Tisserant (24 March 1884 – 21 February 1972) was a French biblical scholar who worked for many years at the Holy See in various capacities. He was a friend of Pope Pius XI, whom he had known since before the pope's election. During a visit to the Abbaye de la Cambre near Brussels on 29 March 1952, he met Cardijn, saying to him: "Ah! Monseigneur! Pius XI told me that it was you who taught him what Catholic Action was." "Le Card. Doyen a rappelé que, à la base de l'action de Pie XI pour l'Action Catholique, reste une audience mémorable avec Mons. Cardijn au printemps 1925. D'après le Card. Tisserant, Pie XI fut tellement frappé par les paroles et l'action de Cardijn, qu'il ne tira les motifs pour ses prochains discours et bien des orientements pour ses opinions à propos de la collaborazion des laïcs." "The Cardinal Dean recalled that, at the basis of Pius XI's action on Catholic Action, there was a memorable audience with Mgr Cardijn in Spring 1925. According to Cardinal Tisserant, Pius XI was so struck by the words and action of Cardijn that he drew on them for his later speeches and many of the orientations for his opinions with respect to the collaboration of the laity." Tisserant's own brother a Spiritain missionary in Africa had also been a leader in Marc Sangnier's Sillon movement.